The 1st Annual Chad McDaniel Memorial sponsored by Revhoney is the first race to be scheduled for 2010. Powri will be hosting the event with Midgets and 600's currently on the ticket. The event will be held to raise money for the Trevor and Taylor education fund. 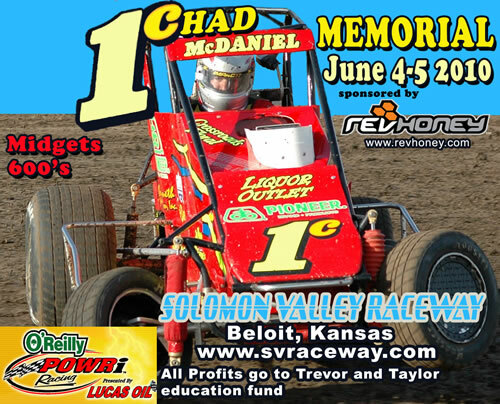 Chad was a large part of bringing midgets to the Solomon Valley Raceway and we plan on honoring him and his family with a huge open wheel event. Tickets will be sold in advance and pre-registration will be required for racers. We will communicate more details as we get them, feel free to send us an email at [email protected]. Thanks for visiting we can't wait to see you at the races! !